The German cockroach is the most important cockroach pest species because of its high reproductive rates, small size and ability to adapt and survive under almost any condition. 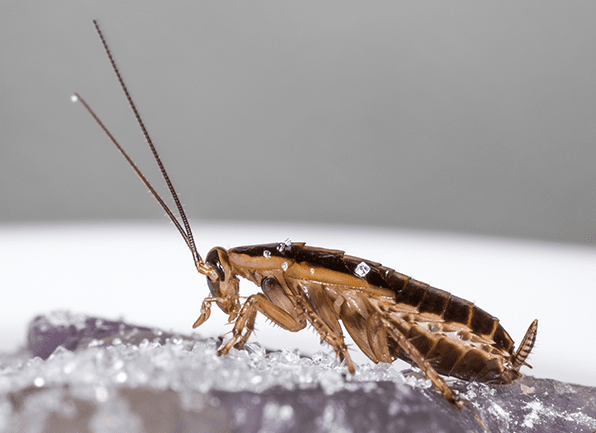 Prior to the new millennium, German cockroaches were the number one pest species throughout the United States. However, the advent of cockroach baits made their control significantly easier. German cockroaches can transmit allergens and diseases to humans with the young, the elderly and those with weakened immune systems being most susceptible. This is a small, brown cockroach, approximately 5/8 of an inch in length with two dark lines near their head. Egg capsules are carried by the adult cockroach until they are ready to hatch. Egg capsules contain 36 to 40 eggs per capsule and hatch in 28 days. They spend as much of their life indoors in kitchens and bathrooms. They will frequent unsanitary conditions. They can rapidly infest and proliferate homes, restaurants and other establishments. They are more active at night (nocturnal). Remember the three W's when inspecting: wood, warmth and water. Remove food and moisture sources (i.e., sinks filled with dirty dishes, food spills). Seal cracks in floors, walls and ceilings with a sealant. Keep food containers closed and well sealed. Look beneath base and in control panels of water heaters. Eliminate cluttered areas (i.e., corrugate boxes stored in corners).